The charcuterie tartine at Commune Kitchen in Arlington. At the weeks-old Commune Kitchen in East Arlington, your eye immediately goes to the basket perched above the counter, filled with substantial, fawn-colored loaves. Chef and co-owner Justin Demers loves talking about that bread. “It’s the most beautiful vessel for anything,” he says, explaining that it begins as a “living organism” due to a starter culture that’s fed twice a day. That natural levain is folded together with flour, salt, and water, then placed in a cooler overnight. The next day, the much-expanded dough rests before being hand-shaped and popped into a stone oven. It’s a painstaking process, but the chef wouldn’t have it any other way. Prior to opening the 35-seat spot (where Zocalo Cocina Mexicana used to be), Demers and co-owner Richard Niedzwiecki worked at Clear Flour Bread in Brookline. Demers also cooked at Somerville’s Bergamot restaurant, a job he says “whipped me into shape” after culinary school at Le Cordon Bleu in Cambridge. That background in fine dining makes the difference. This spot is all about soulful, hand-crafted fare. Tartines, grilled bread with hearty toppings, anchor half the menu. The balance is devoted to pizza, crafted from long-fermented dough, with an array of craveable toppings. These savory pies are — thankfully! — a far cry from the pepperoni variety ubiquitous in the ’burbs. Take for example the porchetta pizza ($10), sporting a sumptuous, puffed crust, gently blistered from the oven’s high heat. The 12-inch pie is slathered with a bright, flavorful sauce of crushed tomatoes, mozzarella, roasted fennel, zingy cherry peppers, and delectably thin slices of pork roast. The chef butterflies a shoulder cut, marinates it, then adds a layer of breadcrumbs, rosemary, basil, and lemon zest. The rolled and trussed meat is roasted low and slow for hours. No cutting corners here. 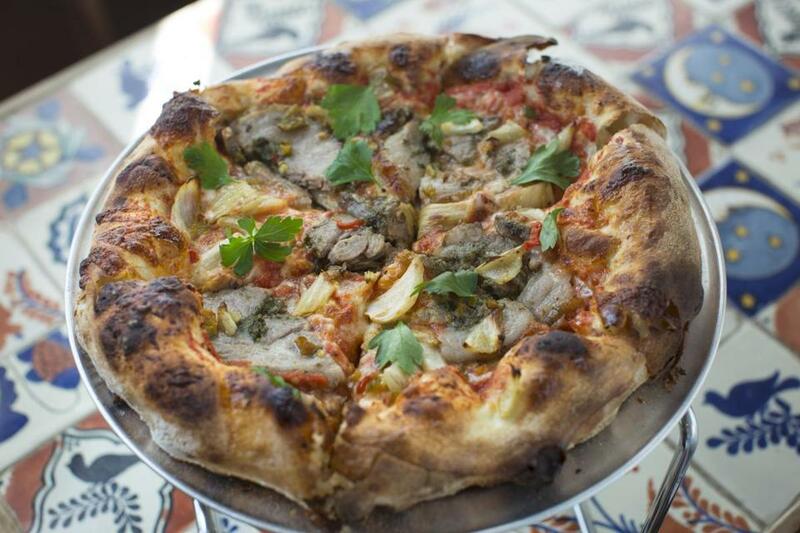 The porchetta pizza at Commune Kitchen in Arlington. The term “tartine” is new to many. “I tell them it’s an open-faced sandwich,” says the chef. 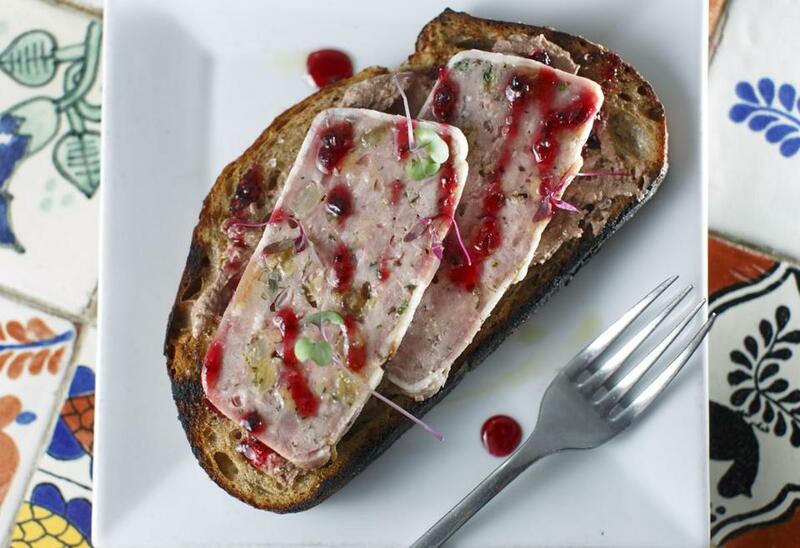 “It’s anything that you serve on a slice of crusty bread.” We choose the charcuterie tartine ($7.75), a beautiful assemblage of chicken liver mousse and a thick slice of house-made pate de campagne studded with golden raisins. The fetching dish is drizzled with ribbons of blackberry preserves. Microgreens provide a welcome touch of greenery. A bacon and egg tartine ($7.25) offers pure comfort, heaping soft scrambled eggs, pimento cheese spread, strips of smoky cured meat, and caramelized onions on a toasty foundation. Seasoned house fries ($5.50) with garlicky herb aioli stand in handily for breakfast potatoes. Burrata with stewed figs, caramelized walnuts, and bacon at Commune Kitchen in Arlington. The menu’s current offerings are quite filling and rich. Demers says that more “salady” options will soon debut for summer. Don’t be afraid to request modifications. 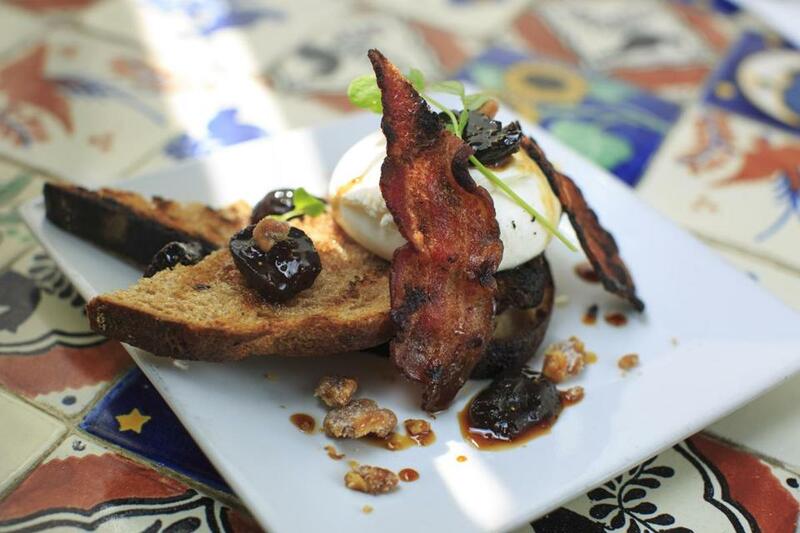 A side of burrata (stretchy mozzarella curd filled with heavy cream) served with bacon, stewed figs, and sugared walnuts can be nestled on arugula rather than bread, if you ask. Nonalcoholic libations ($1.25-$3.25), like fair trade cold brew coffee or an Italian soda with house-made raspberry syrup, give a nod to warm weather. A drink special, an orange-rosemary cooler, is tartly sweet, presented with a fresh sprig of the resinous herb. 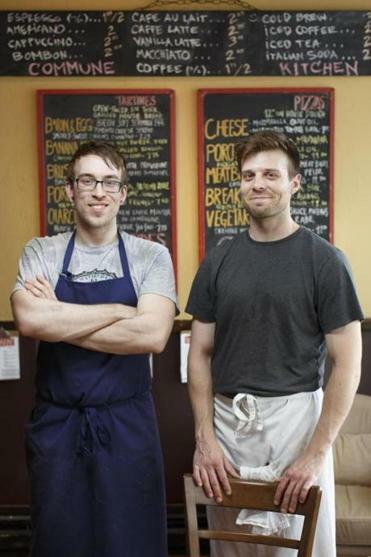 Chef Justin Demers and Richard Niedzwiecki, co-owners of Commune Kitchen in Arlington. It’s smart to arrive right at opening. The neighborhood took just days to discover the spot, tucked on a quiet street a couple of blocks from Massachusetts Ave. Fit folk from the nearby yoga studio drop in for lemonade, and the stroller brigade is here in full force. We pick up a signature loaf to go ($7) and talk about what we’ll get next. The poutine? A stuffed croissant? We’ll decide when we swing by tomorrow. Prices Tartines $6.50-$7.75. Pizza $9.25-$10. Sides $5.50-$7.25. Beverages $1.25-$3.25. Pastries $2-$4. What to order Charcuterie tartine, bacon & egg tartine, porchetta pizza, vegetarian pizza, burrata, seasoned fries.